A new space telescope tells us we really had no idea what was going on out there. One crisp summer day in upstate New York, a restless crowd wove its way into a small conference room in the Bausch & Lomb physics hall at the University of Rochester. Outside, the sun sliced through a flawless azure sky, and a warm breeze danced off the gentle waves on Lake Ontario. Inside, I squeezed in among the two dozen professors and students and waited for the presentation to begin. Then the lights dimmed, and any longing for the lovely day outside was instantly displaced by the far more powerful allure of new worlds coming into view, worlds located many light-years away. A computer projector snapped on and began displaying data from the Spitzer Space Telescope, a powerful companion to the famed Hubble Space Telescope. Spitzer was launched the previous summer, and my colleagues and I were witnessing some of its earliest results: evidence of planets being born around nearby stars. The actual data did not look like much, mostly line graphs showing the intensity of radiation emitted by the stars at various wavelengths, but the meaning hidden behind those numbers had us talking all at once, lost in the fever of discovery. Spitzer was designed to pick up infrared rays that, unlike visible light, can penetrate thick dust and probe the dense interstellar clouds where stars and planets form. After just a few months of operation, the telescope already exceeded its creators’ optimistic expectations. Not only had it clearly identified evidence of newly formed planets, it had demonstrated that the planet-building process is far wilder, messier, and more varied than anyone expected. The truth is that astronomers still do not know much about the origin of planets, but they are learning quickly. For a long time the only solar system they were able to study was our own, which formed a long 4.6 billion years ago. Over the past decade, the discovery of planets around other stars and the development of intricate computer simulations have suggested that our solar system is something of an oddball. Planet building seemed to favor giant worlds careering around their stars in extreme orbits. Most of the worlds we have found seem unlikely to support life. Spitzer’s findings suggest that nature is far more interesting than that. Planets seem to form in all kinds of orbits and in all kinds of distances from their stars. They also form through processes that do not clearly fit into any of the standard theoretical models. Small, rocky bodies may aggregate gradually over hundreds of millions of years, while nearby—maybe even around the same star—Jupiter-size objects pull together in just a few hundred years. All this variety probably includes countless bizarre worlds, but also many that are similar to Earth. That is why the mood in that conference room was electric. Spitzer was unmasking the secrets of planet building, the process that created our own solar system and that may, at this very moment, be creating new habitable worlds around other stars. Astronomers deduced the basic recipe for making planets a long time ago, and it could hardly be simpler. Just take an interstellar molecular cloud—in essence, a big bag of cold gas and dust—shake it lightly and allow the ingredients to settle. When the gas and dust begin to collapse under their own weight, the bulk of the material falls to the center, giving rise to a protostar. Meanwhile, any slight rotation in the original cloud is enormously amplified as it contracts. The spinning motion flattens the material into a round disk of gas and dust that spirals inward and rains down onto the natal star for about a million years. Planets begin to form in the plane of the disk from leftover scraps. This process tidily explains why all the planets in our solar system orbit in the same direction and in nearly the same plane. Those theories got a jolt 10 years ago, when astronomers first began discovering planets outside our solar system orbiting other stars. To everyone’s surprise, the alien solar systems looked nothing like ours. Many are home to so-called hot Jupiters, massive gas balls orbiting extremely close to their parent stars and roasting at temperatures in excess of 1,000 degrees Fahrenheit. Many of the newfound worlds follow highly elliptical paths that take them close to and then far away from their star, quite unlike the nearly circular orbits typical in our solar system. Researchers used to think that planets stayed where they initially formed, but the existence of hot Jupiters suggests that orbits often shift radically during the early life of a planet. Massive planets might originate far out and then spiral inward due to gravitational interactions with their disk. Such orbital migration would destroy any smaller, Earth-like planets that had formed, as an inward-moving giant would scatter smaller planets the way a bowling ball would blast through a pile of marbles. That is why the timing and the scale of planet formation—fast or slow, big or small—is a critical issue. For gas giants like Jupiter, formation theories come in two flavors. The planet can form quickly when a large chunk of the disk becomes gravitationally unstable and collapses on itself. In some models, such instabilities can produce a planet in a few hundred years or less, possibly even in a single human lifetime, but only if the disk is very dense and cold. Alternately, the planet can accumulate mass slowly as bits of dust collide and become pebbles, which collide to become boulders, which collide to become asteroids, and so on, until a rocky planetary core develops. When the core has enough gravity to attract gases in the disk, it begins to accumulate an atmosphere. This process, sometimes called core accretion, is rife with uncertainties. Models do not reveal exactly how long it takes to make a space mountain out of a space molehill. The timescale usually associated with core accretion is tens of millions of years. Computer simulations suggest that smaller, terrestrial worlds probably arise slowly, through the core-accretion process. Then again, all of these theories and their impressive-looking conclusions are only as good as the assumptions built into them. “So how long does it all take—a thousand years or 10 million years?” Rieke asks. “The theorists can argue about it forever. What is needed is real data from real planet-forming systems.” That is exactly what is coming every day from Spitzer. •A previously unknown globular cluster—a vast ball of ancient stars—orbiting our galaxy. •Enormous, enigmatic blobs of gas that may arise when one galaxy plows headlong into another galaxy. •An entire population of monstrously bright galaxies, unseen until now because they are completely cloaked in dust. 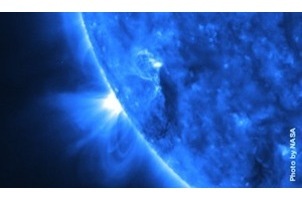 •Two mature planets circling other stars, detected directly for the first time. Spitzer showed that these worlds are fiercely hot, more than 1,300 degrees F.
For many years scientists wondered if the Spitzer telescope would ever make it from the drawing pad to the launchpad. The concept started life in the late 1970s as an infrared observatory that could fly short stints aboard the space shuttle. (Its name pays homage to an earlier era: the 1940s, when the influential astronomer Lyman Spitzer Jr. made the first serious proposals for building large observatories in space.) During the 1980s the Spitzer expanded in scope to a free-flying observatory. In the 1990s, the project shrank again in response to budget pressures. Through all these ups and downs, the essential mission of Spitzer remained constant: to learn more about the universe by detecting infrared rays, electromagnetic waves slightly longer than visible light. Such rays are ideal for studying cool objects—those that don’t attain the blazing heat of the sun and other stars—which give off little light but glow prominently in the infrared. More crucial, infrared rays penetrate effectively through dust clouds, making it possible to peer into otherwise obscured regions of space. What changed during the redesigns was the telescope’s specific capabilities. “Spitzer was supposed to be the Swiss Army knife of infrared space telescopes,” says astrophysicist Dan Watson of the University of Rochester, who has participated in the project since its inception. “But as time went on the project got de-scoped. We had to circle the wagons around a few projects that could still be done.” Studying the birth of planets in the cool, dusty cocoons around infant stars turned out to be the perfect task for the downsized and reconfigured observatory. The telescope is built around a 34-inch-wide beryllium mirror, cooled by liquid helium to –450°F to eliminate the infrared noise that every warm object emits. Infrared rays collected by the mirror bounce to one of three instruments: an imaging camera, a spectrograph that breaks up infrared light into its constituent wavelengths (creating an infrared rainbow), and a combined camera-spectrograph that studies a somewhat different part of the infrared spectrum than the other two. Many teams across the country oversaw the design and construction of each instrument; researchers in my group at the University of Rochester collaborated on both the camera and the spectrograph. Spitzer’s spectrograph had split up infrared light from the baby star Cohen-Kuhi Tau/4, located 420 light-years away in the constellation Taurus, and spread that light out by wavelength. The spectrum showed how much energy the star emits at various wavelengths, each of which corresponds to a temperature. A naked star produces a single-humped spectrum, with the bulk of the energy concentrated at short, hot wavelengths. The cold, dusty disks around a star emit copious long infrared waves, producing a second hump in the spectrum. What Watson and his student saw did not fit either pattern. Clearly there was a young star, and clearly there was a cold disk, but something had taken a big bite out of the disk’s infrared signature. “The light from the inner part of the disk was totally missing,” Watson says. “I knew immediately what it meant.” He cleaned up the data and passed it along to Bill Forrest, his collaborator. “Right away, I knew we had found a planet,” Forrest says. If part of a disk is missing, something must have cleared it out. Soon after a giant planet forms, its gravity sweeps out a ring-shaped gap in the disk. In time, that gap expands into a hole as the remaining inner parts of the disk drain onto the star. The gap around Cohen-Kuhi Tau/4 most likely arose this way. Until Spitzer, the best that infrared telescopes could do was find hints of such gaps around a few relatively close, bright young stars. “Spitzer’s instruments are far more sensitive than anything before it,” Rieke says. “That means we can look at regions of the galaxy where stars are forming that are much farther away than we could before. By seeing so many star-forming regions, we can catch the star- and planet-creation process happening at different stages.” Infant stars in the Cohen-Kuhi region, for example, were too distant and dim to study using earlier telescopes. Cohen-Kuhi Tau/4 is at an early stage of evolution, one that nobody had examined in detail before. After a thorough study of its brightness and temperature, an international team that included Watson and Forrest concluded that the star and its disk are about a million years old, roughly a tenth the age of any stellar system that has shown a sizable hole. For the first time, astronomers have compelling evidence that planet formation can be a fast process. Here it had to happen in less than a million years. All through the summer of 2004, the University of Rochester astronomy group gathered at lunchtime on Tuesdays to review, discuss, debate, and generally let our jaws drop over the new Spitzer data. One week we contemplated images of newly formed star clusters; another week we examined beautiful spectra of ice grains swirling around an infant star. On the day that the observers presented the Cohen-Kuhi Tau/4 results, there was a long moment of quiet. Every person in the room, from the most senior professor to the greenest graduate student, knew this was the kind of moment that justified decades of work. Then the buzz began. The theorists in the group, led by Alice Quillen and Eric Blackman, stepped up to the whiteboard in the lunchroom and began sketching the links between planets and holes in a protostellar disk. Then the questions started to come into focus. What would the mass of the planet have to be? What mechanisms could form a planet that quickly? Could other planets survive in the disk? Everyone started talking at once, and the conversations quickly splintered. By the end of the lunch hour, factions had reconvened, and the outlines of a paper were already taking shape. Within a week we theorists found that a planet responsible for the hole did not need to be as massive as Jupiter. A body twice the size of Neptune and about one-tenth as heavy as Jupiter (but still about 30 times the mass of Earth) would have sufficed. This lower limit was intriguing because the outer edge of the hole is about as far from its star as the giant planets in our solar system are from the sun. Unlike the many bizarre, star-hugging worlds discovered by other means, the planet that seems to be orbiting Cohen-Kuhi Tau/4 looks reassuringly familiar. Spitzer seemed to have uncovered a new planetary system built on the same overall engineering plan as our own. We also found that the alien planet must have formed no more than a few hundred thousand years ago. If it were any older, the gravitational interaction between the disk and the planet would have forced it to spiral inward, perhaps even to be swallowed by its star. That timescale supported rapid planet-formation models. In other ways, however, Cohen-Kuhi Tau/4 didn’t fit the models at all. The disk around the star appeared too small and low mass to support the leading rapid-formation theory, the gravitational instability model. In fact, the Spitzer results did not fit well with any existing theory of how planets form. The new data and our new calculations were forcing us to rethink our assumptions. We soon realized that the discovery of the hole in the disk around Cohen-Kuhi Tau/4 was only the beginning of a story. Since then, scientists have discovered similar partly empty disks around many other young stars. The strange answer is that planet formation is not fast or slow; it is fast and slow. On average, the disks studied by Spitzer turn out to be 100 million years old, one hundred times the duration of planet formation implied by the Cohen-Kuhi Tau/4 results. This finding startled astronomers who had just absorbed Spitzer’s evidence that planets may form extremely rapidly. They had assumed that fast planet building would deplete the surrounding material and make the disks disappear quickly. Instead, Spitzer was showing that disks, and perhaps subsequent rounds of planet building, could go on far longer than even the old core-accretion models implied. For instance, the bright star Vega—shining high overhead on summer nights in the Northern Hemisphere—is 100 million years old, yet it still has a disk. The observable material is a so-called debris disk consisting entirely of dust and large rocks, some of them possibly as large as planets. Such disks have lost all of their gas and are far less dense than the ones around younger stars. That dust cannot be primordial material because it would have fallen into the star long ago. “With Spitzer we found clear evidence that Vega and other stars have recently had their debris disks resupplied with dust,” Rieke says. “The only way to produce as much dust as we are seeing in these older stars is through huge collisions.” Larger bodies, such as giant comets, asteroids, and protoplanets, must have coalesced from the original disk and then crashed into one another. Such impacts are a key feature of the core-accretion model, yet nobody expected to find the process continuing around a star as old as Vega. Evidently the building blocks of planets keep colliding, merging, shattering, and pulverizing one another long after the first large bodies come together. “It’s a mess out there,” Rieke says. “We are seeing that planets have a long, rocky road to go down before they become full grown. The kinds of processes we associate with planet building—big collisions—are still going on, even though these systems are so old.” Those long timescales may bode well for the existence of Earth-like planets. Rieke notes that our solar system contains a faint debris disk of its own—micrometer-size dust particles slowly spiraling in toward the sun. We see this disk as a dim glowing band, called the zodiacal light, running along the plane of the planets. Under clear skies, it shows up as a diaphanous cone of light hanging in the west after sunset. “The zodiacal light comes from sunlight reflected off dust grains blown off comets or from asteroid collisions,” Rieke says. “If you could look at our solar system 5 billion years ago, it would probably look similar to what we are seeing in Vega.” Put another way, the dust around Vega is a reassuring sign that many stars form planetary systems broadly similar to our own. Whenever a major new instrument switches on, the dance between theory and observation in science always turns from a stately waltz into a chaotic jitterbug. After a little more than a year in orbit, the Spitzer Space Telescope has sped the tempo of discovery in planet formation studies so much that scientists are overwhelmed. The telescope contains enough liquid helium coolant to keep going at this pace for another three years. The cosmos seen by Spitzer seems strangely disconnected from the one predicted by our meticulous models. “We thought that young stars, about 1 million years old, would have larger, brighter disks and that older stars from 10 million to 100 million years old would have fainter ones,” Rieke says. “Instead we found some young stars missing disks and some old stars with massive disks.” The most recent findings from Spitzer continue this confounding pattern. Some mature stars that are known to have planets are still surrounded by debris disks 100 times as thick as the dust in our solar system, for unknown reasons. One middle-aged star, known as HD 69830, appears to be surrounded by an asteroid belt that is 25 times as dense as the one in our solar system, possibly the remnants of a rocky planet that never formed. Spitzer is exposing how much astronomers don’t yet know about the new worlds forming out there—and about the old worlds, possibly even habitable ones, that are still undetected. For scientists, being placed in a position of ignorance is good. That’s when the real work begins.